Breast cancer is the most common invasive cancer among women worldwide. Next-generation sequencing (NGS) has revolutionized the study of cancer across research labs around the globe; however, genomic testing in clinical settings remains limited. Advances in sequencing reliability, pipeline analysis, accumulation of relevant data, and the reduction of costs are rapidly increasing the feasibility of NGS-based clinical decision making. We report the development of MammaSeq, a breast cancer-specific NGS panel, targeting 79 genes and 1369 mutations, optimized for use in primary and metastatic breast cancer. To validate the panel, 46 solid tumors and 14 plasma circulating tumor DNA (ctDNA) samples were sequenced to a mean depth of 2311× and 1820×, respectively. Variants were called using Ion Torrent Suite 4.0 and annotated with cravat CHASM. CNVKit was used to call copy number variants in the solid tumor cohort. The oncoKB Precision Oncology Database was used to identify clinically actionable variants. Droplet digital PCR was used to validate select ctDNA mutations. In cohorts of 46 solid tumors and 14 ctDNA samples from patients with advanced breast cancer, we identified 592 and 43 protein-coding mutations. Mutations per sample in the solid tumor cohort ranged from 1 to 128 (median 3), and the ctDNA cohort ranged from 0 to 26 (median 2.5). Copy number analysis in the solid tumor cohort identified 46 amplifications and 35 deletions. We identified 26 clinically actionable variants (levels 1–3) annotated by OncoKB, distributed across 20 out of 46 cases (40%), in the solid tumor cohort. Allele frequencies of ESR1 and FOXA1 mutations correlated with CA.27.29 levels in patient-matched blood draws. In solid tumor biopsies and ctDNA, MammaSeq detects clinically actionable mutations (OncoKB levels 1–3) in 22/46 (48%) solid tumors and in 4/14 (29%) of ctDNA samples. MammaSeq is a targeted panel suitable for clinically actionable mutation detection in breast cancer. Advanced breast cancer is currently incurable. Selection of systematic therapies is primarily based on clinical and histological features and molecular subtype, as defined by clinical assays . Large-scale genomic studies have shed light into the heterogeneity of breast cancer and its evolution to advanced disease [2, 3] and, coupled with the rapid advancement of targeted therapies, highlight the need for more sophisticated diagnostics in cancer management . Next-generation sequencing (NGS)-based diagnostics allow clinicians to identify specific putative driver events in individual tumors. Correctly identifying disease drivers may enable clinicians to better predict treatment responses, and significantly improve patient care . However, to date, the use of NGS in clinical diagnostics remains limited . Published data regarding prognostic utility, and utilization for selection of targeted therapies or enrollment in clinical trials, is far from comprehensive. The original 46 gene AmpliSeq Cancer Hotspot Panel (ThermoFisher Scientific) was shown to have a diagnostic suitability in primary lung, colon, and pancreatic cancers ; however, our previous report that surveyed the clinical usefulness of the 50 gene AmpliSeq Cancer Hotspot Panel V2 in breast cancer found that the panel lacks numerous known key drivers of advanced breast cancer . For example, the panel does not include any amplicons in ESR1, which harbor mutations which are known to contribute to hormone therapy resistance (for review see ), and lacks coverage of the majority of known driver mutations in ERBB2 . The lack of any reported breast cancer-specific diagnostic NGS test inspired the development of MammaSeq™, an amplicon-based NGS panel built specifically for use in advanced breast cancer. We hypothesized that a breast cancer-specific test may offer a method for identifying therapeutic targets in solid tumor and circulating tumor DNA (ctDNA). Forty-six solid tumor samples from women with advanced breast cancer, plus a separate cohort of 14 samples of circulating tumor DNA (ctDNA) from 7 patients with metastatic breast cancer, were used in this pilot study to define the clinical utility of the panel. The patient cohort encompassed all 3 major molecular subtypes of breast cancer (luminal, ERBB2 positive, and triple negative) and both lobular and ductal carcinomas (Table 1). This report adheres by the REporting recommendations for tumour MARKer prognostic studies (REMARK)  where applicable. The methods for ctDNA isolation, processing, and analysis are in concordance with state-of-the-art approaches cited by the recent joint review from the American Society of Clinical Oncology and the College of American Pathologists [﻿12﻿]. For MammaSeq NGS testing, this study utilized breast tumors from 46 patients and a separate cohort of blood samples from 7 patients. The research was performed under the University of Pittsburgh IRB approved protocol PRO16030066. The general patient characteristics are shown in Table 1, and more detailed patient information is shown in Additional file 1: Table S1. We utilized 46 of the 48 breast cancer cases previously described in a report by Gurda et al. [﻿8﻿]. These cases previously underwent AmpliSeq Cancer Hotspot Panel V2 (ThermoFisher Scientific) NGS testing between January 1, 2013, and March 31, 2015, within the UPMC health system. MammaSeq™ was performed on the DNA originally isolated from these tumor specimens and that was originally used for initial clinical testing [﻿8﻿]. Two cases were excluded due to insufficient DNA. In addition, a separate cohort of 7 patients with metastatic breast cancer (MBC) had 20 ml venous blood drawn in Streck Cell-Free DNA tubes between July 1, 2014, and March 29, 2016. All patients signed informed consent, and samples were acquired under the University of Pittsburgh IRB approved protocol (IRB0502025). We previously reported on the detection of ESR1 mutations in ctDNA from these 7 patients using droplet digital PCR (ddPCR) . Serial blood draws (range 2–5) were available for 4 patients. A total of 14 blood samples from 7 patients were utilized for ctDNA, buffy coat DNA isolation, and NGS testing followed by ddPCR. Blood was processed as described previously . Briefly, venous blood was drawn into leukocyte-stabilizing Streck tubes and processed to separate plasma and buffy coat by double centrifugation within 4 days of blood collection. One milliliter to 4 ml of plasma was used for isolation of ctDNA using QIAamp Circulating Nucleic Acid kit (Qiagen). ctDNA was quantified using Qubit dsDNA HS assay kit (ThermoFisher Scientific). Germline DNA (gDNA) was isolated from buffy coat using DNeasy Blood & Tissue Kit (Qiagen) for use as germline DNA control. gDNA was quantified using Qubit dsDNA BR assay kit (ThermoFisher Scientific). Patient-matched ctDNA and gDNA from the same tube were sequenced to allow subtraction of germline variants and identify somatic variants in ctDNA. Twenty nanograms of DNA (10 ng per amplicon pool) was used for library preparation using Ion AmpliSeq™ Library Kit 2.0 (ThermoFisher Scientific) and the custom designed MammaSeq™ primer panel (Additional file 2: Data file 1). Template preparation by emulsion PCR and enrichment was performed on the Ion OneTouch 2 system (ThermoFisher Scientific). Template-positive Ion Sphere particles (ISP) were loaded onto Ion chips and sequenced. Patient-matched ctDNA and gDNA from the same tube were sequenced. ctDNA was sequenced using P1 chips (60 million reads) on the Ion Proton™ (ThermoFisher Scientific) at empirical depths of 1000× and 5000×, respectively. gDNA DNA was sequenced using 318 chip (6 million reads) on the Ion Torrent Personal Genome Machine (PGM™, ThermoFisher Scientific) at 500×. Ion Torrent Suite V4.0 was used to align raw fastq files to the hg19 reference genome and generate VCF files (4.0% AF cutoff for tumor samples, 1.0% AF cutoff for ctDNA samples). Raw sequence files are available upon request for those wishing to map data to Ch38. Cravat CHASM-v4.3 (http://hg19.cravat.us/CRAVAT/) was used to annotate variants with resulting protein changes and SNP annotation from ExAC  and 1000Genomes . Variant calls from patient-matched gDNA (gDNA isolated from the same blood sample as the ctDNA) were used to remove germline variants from the 14 ctDNA samples in a patient-matched manner. SNP and sequencing artifact filtering, data organization, and figure preparation were performed in R (v3.4.2). The R package ComplexHeatmaps was used to generate Figs. 1 and 3a. CNVKit was used to call copy number across all genes; however, only genes containing more than 3 amplicons were reported (Table 2) . DNA from the buffy coat of the ctDNA cohort was used to generate a single copy number reference which was used as a baseline for copy number calling on the solid tumor cohort. CNKit reports copy number as a log2 ratio change. CNV were reported if the absolute copy number was above 6 (log2(6/2) = 1.58) or below 1 (log2(1/2) = − 1). Annotated, unfiltered, mutation, and CNV data, along with R code related to this study, are deposited on GitHub (https://github.com/smithng1215). Two nanograms of ctDNA or buffy coat DNA was subjected to targeted high-fidelity preamplification for 15 cycles using custom-designed primers (Additional file 3: Table S2) and PCR conditions previously described . Targeted preamplification products were purified using QIAquick PCR Purification kit (Qiagen) and diluted at 1:20 before use in ddPCR reaction. 1.5 μl of diluted preamplified DNA was used as input for ddPCR reaction. ddPCR was performed for ESR1-D538G, FOXA1-Y175C, and PIK3CA-H1047R mutations. Custom ddPCR assays were developed for ESR1-D538G (Integrated DNA Technologies) and FOXA1-Y175C (ThermoFisher Scientific). Sequences are described in Additional file 4: Table S3. PIK3CA-H1047R was analyzed using PrimePCR ddPCR assay (Bio-Rad Laboratories) dHsaCP2000078 (PIK3CA)/dHsaCP2000077 (H1047R). Nuclease-free water and buffy coat-derived wildtype germline DNA as negative controls, and oligonucleotides carrying mutation of interest or DNA from a cell line with mutation as positive controls, were included in each run to eliminate potential false-positive mutant signals. An allele frequency of 0.1% was used as a lower limit of detection. All statistical analysis was performed in R 3.4.2. To determine if there was a significant correlation between mutational burden and copy number burden, we calculated the Pearson correlation coefficient between the number of somatic mutations in each sample, with the number of significant copy number changes in each sample. We did not examine a relationship between mutations and patient outcome due to the small sample size. The mutated gene is among significantly mutated genes (SMGs) in primary and metastatic samples. The mutated gene is clinically actionable (e.g., there is available FDA-approved drug(s) against it). The mutated gene is of functional importance in cancer (e.g., kinase genes were scored higher in the list). The mutation has been found in more than 5 primary tumors OR 2 metastatic tumors. The mutation has been found in both primary and metastatic lesions. The final mutation list was then curated and narrowed down to 80 genes and 1398 mutations. Additional amplicons were added to select genes to ensure sufficient coverage of genes known to harbor functional copy number variants. Amplicon probe design was unsuccessful for 29 mutations, including all 3 mutations in the gene HLA-A, yielding a final panel consisting of 688 amplicons targeting 1369 mutations across 79 genes (Table 2). The percentage of each gene covered is shown in Additional file 5: Figure S1. Panel design is described in Additional file 2: Data file 1). The panel includes 34 of the 50 (68%) genes incorporated in AmpliSeq Cancer Hotspot Panel V2 (Fig. 1). Genes that were not mutated in breast cancer (TCGA and in-house data) and genes that were not considered to be clinically actionable were not included. The MammaSeq™ panel includes 8 of the 10 (80%) genes and ~ 91% of the hotspots targeted by the Thermo Oncomine Breast ctDNA assay. MammaSeq™ covers 14% of the base pairs covered by the Qiagen Human Breast Cancer GeneRead DNAseq Targeted Array; however, it covers hotspots in over half of the genes (57%, plus an additional 34 genes). Of these panels, MammaSeq is the only one that includes CDK4 and CDK6, both of which can be targeted with FDA-approved CDK4/6 inhibitors . Additional genes unique to MammaSeq include common drivers, CCND1, MTOR, and FGFR4. Finally, MammaSeq covers 68 of 315 genes targeted by the larger pan cancer Foundation Medicine, FoundationOne panel. 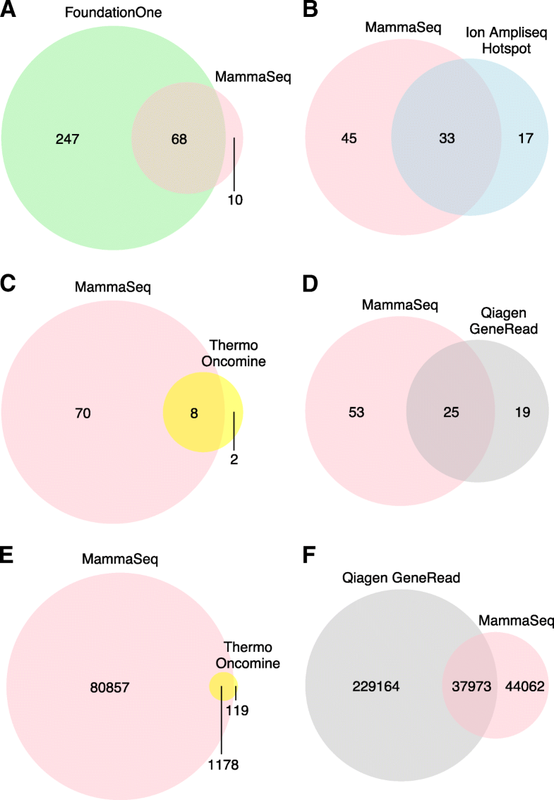 Figure 1 details the overlap in coverage between MammaSeq™ and abovementioned commercially available panels. To evaluate performance in mutation detection by the MammaSeq™ panel, sequencing was carried out on a cohort of 46 solid tumor samples, with a mean read depth of 2311× (Additional file 6: Figure S2). Four thousand nine hundred seventy total variants (mean 106, median 82) were called across all patient samples. We removed identical germline variants that were present in more than 10 samples as these were likely to be platform-specific sequencing artifacts or common SNPs. Removing non-coding and synonymous variants yielded 1433 and 901 variants, respectively. To filter out less common polymorphisms, we removed variants annotated in ExAC  or the 1000Genomes  databases in more than 1% of the population. We removed variants with an allele frequency above 90%, as these were likely germline. Finally, to focus on high confidence mutations, we removed variants with a strand bias outside of the range of 0.5–0.6, yielding a total of 592 protein coding mutations (mean 12.9, median 3, IQR 3) (Fig. 2, Additional file 7:Data file 2). Of the variants (n = 119) previously reported by Gurda et al. on the same cases , > 98% were detected by MammaSeq. Analyzing the variant allele frequencies detected by both assay, we found an outstanding correlation (R2 = 0.98) (Additional file 8: Figure S3). Interestingly, as noted by the variation between the mean and median, the total number of mutations was skewed toward a subset of samples (Fig. 2 top panel). Four hundred eight of the 592 mutations (69%) were found in just 4 of the 46 samples (Additional file 9: Figure S4). These 4 samples are outliers, as they are all more than 1.5 times the IQR plus the median. Counting of tumor infiltrating lymphocytes has not been performed on this cohort and is warranted to support the hypothesis that these tumors have high immune infiltrate and thus may respond to immune therapy. Three of these 4 samples with high mutational burden were of triple negative subtype, while the fourth was ER+/HER2+. The most common mutated genes were TP53 (57%) and PIK3CA (43%). We also noted common mutations in ESR1 (21%), ATM (21%), and ERBB2 (17%). To examine CNV changes, we established a baseline for pull down and amplification efficiency by performing MammaSeq™ on normal germline DNA from 14 samples (7 patients—6 additional). CNVkit  was used to pool the normal samples into single reference and then call CNV in the solid tumor cohort (Fig. 1). CNV were identified in many common oncogenes including CCND1, MYC, and FGFR1. Two of the 3 ERBB2+ samples (via clinical assay) showed CNV by MammaSeq. FGF19 and CCND1 were co-amplified in 9 of the 46 (20%) solid tumors. Both genes are located on 11q13, a band identified in GWAS as harboring variants, including amplifications, associated with ER+ breast cancers . There was not a correlation between mutational burden and copy number burden (Pearson correlation p value = 0.7445). To determine how many of the mutations have putative clinical utility, we utilized the OncoKB precision oncology knowledge database . Twenty-five of the genes in the MammaSeq™ panel (32% of the panel) harbor clinically actionable variants with supporting clinical evidence (OncoKB levels 1–3). In total, we identified 28 actionable variants (26 single nucleotide variants (SNVs) and 2 ERBB2 amplifications) that have supporting clinical evidence (levels 1–3) and an additional 3 actionable variants supported by substantial research evidence (level 4) in the solid tumor cohort (Table 3). The 26 SNVs were distributed across 20 of the 46 cases (43%) (Fig. 3). 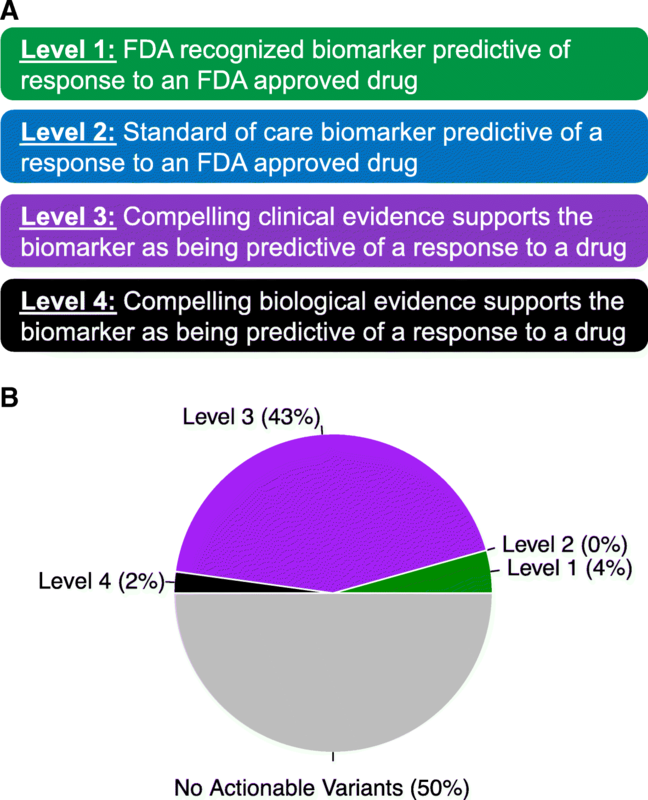 Consistent with the report detailing the development of the OncoKB database , the vast majority of actionable variants in breast cancer are annotated at level 3, indicating that variants have been used as biomarkers in clinical trials; however, they are not FDA approved. In fact, the only level 1 annotated variant in breast cancer is ERBB2 amplification. To examine the potential of MammaSeq™ to detect variants in ctDNA, we sequenced 14 ctDNA samples isolated from 7 patients with metastatic disease, this cohort being independent of the solid tumor cohort above. ctDNA samples were sequenced to a mean depth of 1810×, while patient-matched buffy coat gDNA was sequenced to a mean depth of 425× (Additional file 6: Figure S2). Variants were called on ctDNA and gDNA, and patient-matched variants present in both (i.e., germline variants) were removed. We then applied the same filtering pipeline to the ctDNA variants and solid tumor variants; except in this smaller cohort, we removed all identical variants found in more than 4 samples (as these are likely platform specific sequencing errors) and lowered the minimum allele frequency to 1.0% to increase detection rate in this research cohort. We identified a total of 43 somatic mutations across the 14 ctDNA samples (mean 3.1, median 1, IQR 1.75) (Fig. 4a, Additional file 10: Data file 3). Similar to the solid tumor cohort, a single draw from 1 patient (CF_28-Draw 1) harbored 13 of the 25 (58%) total mutations. Using the same definition, this sample is also an outlier. Similar to the solid tumor cohort, PIK3CA and ESR1 were among the most commonly mutated genes. Two of the identified somatic mutations (each identified in 2 draws from 1 patient) are annotated at level 3 in the OncoKB database, ESR1-and PIK3CA-H1047R (Fig. 4a). The ESR1 mutation was identified in 2 separate blood draws from patient CF_28 taken 13 months apart. Interestingly, the FOXA1-Y175C mutation was also identified in the same draws from patient CF_28 (Fig. 4b). The allele frequencies of the ESR1 and FOXA1 mutations, but not the total number of mutations, strongly correlated with levels of cancer antigen 27-29 (CA-27.29). Mutations identified in all three genes (ESR1, PIK3CA, and FOXA1) were independently validated using ddPCR (Additional file 11: Figure S5). Advances in the accuracy, cost, and analysis of NGS make it an ideal platform to develop diagnostics that can be used to precisely identify treatment options. MammaSeq was developed to comprehensively cover known driver mutation hotspots specifically in primary and metastatic breast cancer that would identify mutations with potential prognostic value. Typically, NGS diagnostics are reserved for late-stage disease. As a result, the solid tumor cohort was significantly enriched for metastatic disease and markers of poor prognosis—triple negative subtype, late presentation, and therapy resistance , whereas the ctDNA cohort was mainly ER+ disease. As such, different mutations were found in each cohort, e.g., TP53 mutations were common in the solid tumor cohort but rare in the ctDNA likely due to the differences in breast cancer subtype. Consistent with previous mutational studies, we report that a small subset of breast cancers harbor high mutational burden . Across a variety of cancers, groups have demonstrated the correlation between the tumor mutational burden (TMB) and the efficacy of immunotherapy checkpoint inhibitors (reviewed here ). However, the ability to accurately depict tumor mutational burden is dependent on the percentage of the covered exome. A study by Chalmers et al. used a computational model to show that below 0.5 Mb, TMB measurements are highly variable and unreliable . The MammaSeq™ panel covers just 82,035 bp (0.08 Mb) and therefore likely cannot be used to calculate a mutational burden comparable to whole exome-based studies. That being said, the stark difference in the total number of mutations identified in the subset of 4 tumor samples suggests a high TMB, meaning these patients may be suited for immunotherapy. Limitations of this study include the small cohort of patients, the observational nature of the cohort that limits association of mutations with outcome, the inability to completely capture all mutations given rapid advances in the field, and the potential for false-positive results given challenges with detection of rare events, particularly in ctDNA. We also note that there were different breast cancer subtypes in the solid and ctDNA cohorts. Despite these limitations, we believe the pilot study shows that the MammaSeq panel is useful for researchers to rapidly and cost-effectively detect somatic mutations in solid tumors and ctDNA. Liquid biopsies are beginning to be utilized clinically after numerous proof-of-principle studies have demonstrated the potential of circulating tumor DNA (ctDNA) for prognostication, molecular profiling, and monitoring disease burden [13, 29–33]. We have demonstrated that the MammaSeq™ panel can be used to identify mutations in ctDNA. For one patient (CF_28), we have ctDNA data from 5 blood draws taken over the course of 13 months. The sharp drop-off in the number of somatic mutations identified between the first and second draws co-occurs with a decrease in CA.27.29 levels, suggesting that the patient may have responded well to treatment, leading to disappearance of sensitive clones. In the later blood draws, we did not observe an increase in the total number of somatic mutations, but instead an increase in the allele frequency of ESR1-D538G and FOXA1-Y175C mutations, which may suggest therapeutic selection of resistant clones. Numerous studies are currently examining longitudinal changes in mutations in ctDNA, and a recent comprehensive analysis using whole exome sequencing in non-small cell lung cancer revealed diverse changes in mutations over time . High-throughput genotyping of solid tumors and continual monitoring of disease burden through sequencing of ctDNA represent potential clinical applications for NGS technologies. The detection of rare events is challenging due to the false detection rate of different NGS platforms. We have used extra deep sequencing to reduce the false-positive rate, but alternative approaches such as inclusion of UMIs can be utilized. More research is required to enhance the sensitivity and specificity of mutation detection in ctDNA. We note that the 1% allele fraction cutoff we used in the ctDNA analysis is for research purposes to increase sensitivity, and this is not clinically validated. It should be noted that targeted DNA sequencing panels such as MammaSeq™ are far less comprehensive than whole exome sequencing and they do not allow for evaluation of structural variants, which may lead to gene fusions that function as drivers . However, the small panel combined with amplification-based sequencing allows for detection in very small amounts of DNA (10 ng) and thus is suitable for small biopsies. Focused panels represent cost-effective and useful alternatives to whole exome sequencing for targeted mutation detection. Here we report the development of MammaSeq™, a targeted sequencing panel designed based on current knowledge of the most common, impactful, and targetable drivers of metastatic breast cancer. This data provides further evidence for the use of NGS diagnostics in the management of advanced breast cancers. We are thankful to the patients who generously provided tumor tissue for our studies and to the surgical, pathology, and tissue bank colleagues for their substantial assistance and support. Beth Knapick provided technical assistance with sample processing. This project used the University of Pittsburgh HSCRF Genomics Research Core, and the UPMC Hillman Cancer Center Tissue and Research Pathology Services that is supported in part by award P30CA047904. We thank Louise Mazur and the UPMC Cancer Registry for clinical abstraction. Research funding for this project was provided in part by a Susan G. Komen Scholar award to AVL and to SO, the Breast Cancer Research Foundation (AVL and SO), the Fashion Footwear Association of New York (SO and AVL), and a research grant from Glimmer of Hope. Annotated, unfiltered, mutation and CNV data, along with R code related to this study, are deposited on GitHub (https://github.com/smithng1215). RJH, AB, PCL, AIW, and AVL designed the MammaSeq panel. NGS, GTG, OSS, and RG analyzed the data and wrote the manuscript. AMB, SP, AIW, PCL, and KK collected the samples. AIW, PCL, and GTG performed the sample processing, quality control, and sequencing. NGS, RG, and AVL analyzed the data and wrote the manuscript. SO, YEN, and MNN provided critical feedback on the panel design and manuscript writing. All authors read and approved the final manuscript. The research was performed under the University of Pittsburgh IRB approved protocol PRO16030066. RJH received salary and has ownership interest (including patents) in Foundation Medicine and is currently an employee at AstraZeneca. The other authors declare that they have no conflict of interests.